This is where we discuss your favorite vintage series books from Nancy Drew and the Hardy Boys to Trixie Belden and the Three Investigators to all other similar vintage series books. 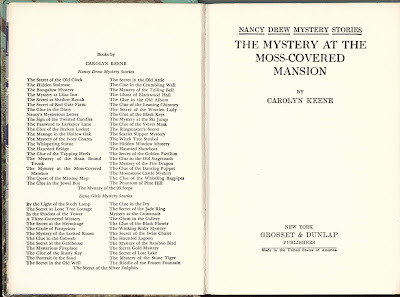 Many of the picture cover Nancy Drew books have just one printing that lists to Fire Dragon on the back cover, so all copies that surface that list to Fire Dragon for those particular titles must be first picture cover editions. This is the case for #18, The Mystery at the Moss-Covered Mansion. The first picture cover printing of #18 lists to Fire Dragon on the back cover and to Dancing Puppet on the inside. The second printing cover printing lists to Whistling Bagpipes on the back cover and to Dancing Puppet on the inside. 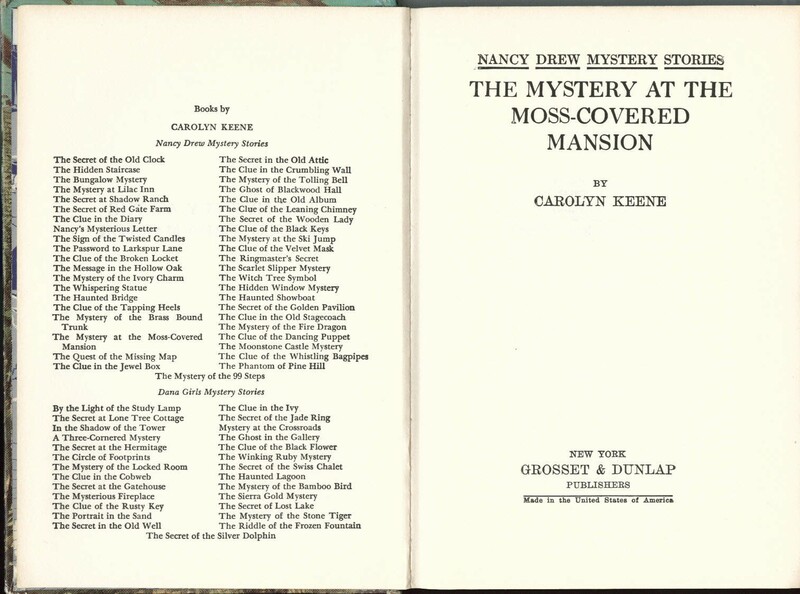 I had what I thought was a first picture cover printing of the Nancy Drew book, The Mystery at the Moss-Covered Mansion. I had identified it as the first PC based on the back cover list, since only one printing lists to Fire Dragon on the back cover. I put the book up for sale, giving the interior list information. As I listed the book, I failed to register the fact that the interior list for this book goes to 99 Steps and Dana Girls to Silver Dolphin. A prospective buyer pointed out the discrepancy, which I thought was a mistake on my part. I was chagrined to discover that the book does list to 99 Steps and Silver Dolphin on the inside, and I did not even notice the problem. The book is supposed to list only to Dancing Puppet and Sierra Gold, yet mine lists all the way to 99 Steps. This is another odd one that does not fit. The outside of the book appears to be from 1962 while the inside appears to be from 1966 to 1970. I'm keeping this book for now, since it interests me. Just another example that boards and texts didn't always get put together right according to guides. Leftover boards, DJs, endpapers, and texts often got used up at later times. One guide calls these combos 'mules'. Don't ask me where that came from! It often happens in publishing and these variations are often quite valuable. They sometimes get mistaken as 'true firsts' (like the $15k Hardy Boys HOODED HAWK 'true first')by glory-hound collectors, but they are just mistakes or variants. A true first printing of a handful of books is nonsensical. Drew and Hardy printings, especially, were in the thousands. This happened with some of the 70s Drews - leftover tweed texts were put in the first boards of the PCs, so the texts differed ever so slightly and the guides figure them as firsts, when all of them are really PC firsts, just some got leftover tweed texts. One has to beware of the 'true first' label. The only real 'true' first is one that is stated or coded inside as being a first printing or edition, and we know that never happened with G&D books. I don't believe Farah accounts for the differences between the differences between Donnelley vs. Kingsport printings for those titles without text lists. The Kingsport were definitely earlier, and easily identifiable. Just another example that boards and texts didn't always get put together right according to guides. This book definitely falls into that category. I love finding books like this one. It often happens in publishing and these variations are often quite valuable. That is precisely why I'm keeping this book for now. It's not that I believe it will be valuable; rather, it is the only one that has thus far come to light, so I think it is interesting. Farah has made note of this book's existence, but it will not be added to the guide unless further examples surface. If I keep it, then we'll know if any additional ones show up. It sounds like another book that I have mentioned in this blog is apparently going to be added to Farah's Guide in a future edition. I'll have a post on that one sometime in the next week. I didn't understand the Donnelly vs. Kingsport comment. Could someone explain please? 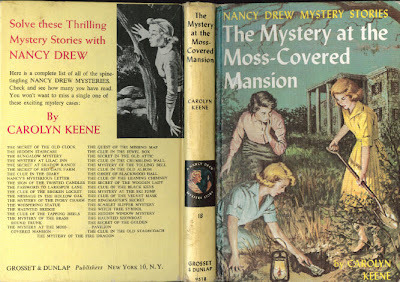 I love to learn anything new about Nancy Drew books! I think Mike is right about these variants being more common than people think. A mule is the offspring of a female horse and a male donkey, so "mule" seems like a good term for these variants! (Two things that don't usually go together, but end up in one book..) :) I think Mike has mentioned before that the guides recognize some of these variants as separate "printings", when in fact they may not be, and considering their scarcity, probably aren't. Your post on Crossword Cipher comes to mind! So, although I'm not bashing the guides (because it's way better to have some guide than none), I think folks referring to any of the guides as "the bible" makes newbies, or collectors who are not as into it as we are, ;) think the information contained therein is undeniable fact rather than guiding information. When the guide lists a variant as a printing, it automatically gives those books more weight as a collectible, and being more scarce, the value of the variant "printing" will then most probably go up. So we would all be smart to hang onto variants, IMO, because if they are ever singled out in a guide they may become more valuable. As a collector, I don't get that, in Farah's Guide, every printing after the first is given the same value until the next format change occurs. Is this done for simplicity's sake, just to give an average price for books that are not firsts but are of the same format? Or do most collectors really lump all these books together? I understand the desire to have a first printing, or a first of any change. But the closer the book is to the first printing, the more valuable it seems to me. For example, a 2nd or 3rd printing of a 1960's picture cover in very good condition/excellent condition, is more desirable to me than one in the same condition printed 5 years out. And if a variant has been listed in Farah's as a 1st printing (Crossword Cipher? ), all owners of "2nd" "printings" may actually have a first print run book! I would like to get some feedback on this from anyone who wants to comment. Jennifer, is the other book you mentioned that will be in Farah's Guide the one (Fire Dragon I think?) that looks like a first except it lists to Dancing Puppet inside instead of Fire Dragon? It has the $1 box too? I think the Donnelly vs. Kingsport comment is in reference to which bindery printed the Grosset and Dunlap books. Kingsport was the one that did for many years, during the 1960s and 1970s for sure. I believe the bindery changed during the 1980s, which is why the quality of the double oval endpapers books is lower. I don't know the details, however. I think Mike has mentioned before that the guides recognize some of these variants as separate "printings", when in fact they may not be, and considering their scarcity, probably aren't. Your post on Crossword Cipher comes to mind! So, although I'm not bashing the guides (because it's way better to have some guide than none), I think folks referring to any of the guides as "the bible" makes newbies, or collectors who are not as into it as we are, ;) think the information contained therein is undeniable fact rather than guiding information. Exactly. I strongly disagree with the usage of the word "bible" to describe Farah's Guide. This is not a religion, yet some people act like it is. Likewise, I am not bashing the guide either. I find it to be a necessary part of my Nancy Drew collecting, and I would not know as much as I do without it. But, the scarcity of the Farah's Guide printings is unequal, which means that they are not all actual printings. Farah is actually tracking all of the variations but referring to them as printings. That is what people need to understand. As a collector, I don't get that, in Farah's Guide, every printing after the first is given the same value until the next format change occurs. Is this done for simplicity's sake, just to give an average price for books that are not firsts but are of the same format? It is probably to keep it simple, or it may just be Farah's opinion. I have a post in progress that I will finish eventually, in which I want to discuss the Farah's Guide values and how actual sales of the books differ. People should always remember with any guide that the prices are just a guide and actual value can be either higher or lower than what the guide states. I've been criticized on prices in cases where I choose a value higher than Farah's Guide. I also have had people use the Farah's Guide prices to try to get me to lower my prices. Interestingly, each time someone tries that, someone else buys the book at my asking price without comment. The Fire Dragon $1 box book is the one that looks like it will make it into Farah's Guide. I know of other books like the one mentioned here, and one comes to mind that is even listed in the Hardys guide. It is a 1971 'printing' of THE DISAPPEARING FLOOR. It has the revised 1964 text but the back board only lists to #40 like the first PC printing from 1962. It's an obvious case of a really-left over set of boards being used way down the road, nine years later. Makes you kind of wonder where the boards were hiding all that time. In the guide it gets 'printing' status, which is surely debatable, but there are indeed a number of these around - one listed in the guide, I have one, and a few others in collections. So they did make a bunch of them. Probably a bunch of old boards were found and they used them up. If I were a guide maker, I'd give these 'mules' special status and their own section. They are really interesting books.